This article is the first in a series of several where we are exploring the various hedging strategies which are available to commercial and industrial natural gas consumers. 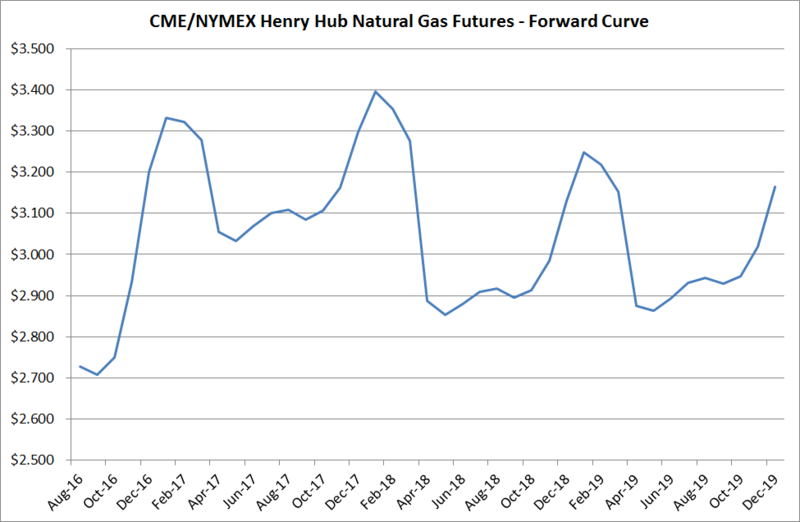 In the North American natural gas markets, NYMEX Henry Hub natural gas futures are the mainstay product as virtually all natural gas produced, marketed, traded and consumed in North America is priced, directly or indirectly, to the NYMEX Henry Hub futures contracts. In addition, Henry Hub futures also attract significant interest from speculative traders. As a result, it is the third-largest physical commodity futures contract in the world by traded volume. We’ll address natural gas hedging in other regions of the world (e.g. Europe and Asia) in a series of future posts. The purchase of a NYMEX natural gas futures contract obligates the buyer to take delivery of 10,000 MMBtu of natural gas at "Henry Hub," which is located in Erath, Louisiana. Conversely, the sale of a NYMEX natural gas futures contract obligates the seller of the contract to make delivery of 10,000 MMBtu of natural gas at Henry Hub. However, in practice, very few futures contracts actually result in delivery, the vast majority are utilized for hedging or speculation and are sold prior to expiration. As an aside, if you're unfamiliar with NYMEX natural gas futures, you can obtain the complete contract specifications via the CME website. So, assuming a company does not need nor want to take delivery of a natural gas futures contract, how can they utilize the Henry Hub futures contract for hedging purposes? Let's assume that you are an large natural gas consumer in southern Louisiana who wants to "lock in" the price you will pay for natural gas this December to ensure that your costs are within your budget. For sake of simplicity, let's assume that your anticipated consumption in December is 12,500 MMBtu and that you want to hedge 80% of your anticipated consumption. To accomplish this you could purchase one December NYMEX natural gas futures contract. If you were to purchase this contract today based on the current market price, you would be able to fix your natural gas cost for $3.208/MMBtu plus transportation and distribution fees. Now, let's fast forward to November 28, the expiration date of the December NYMEX natural gas futures contract. As you have determined that you do not want to take delivery of the futures contract, you decide to sell your December natural gas futures contract at the prevailing market price on November 28. In the first case, let's assume that the prevailing market price, at which you sell your futures contract, is $4.00/MMbtu. As a result, if we exclude the fees you pay to your LDC (local distribution company) for gas transportation and distribution as well as regulatory fees, taxes and your natural gas supplier's profit margin, your natural gas cost for December would be $4.00/MMBtu. However, as a result of your hedge at $3.208/MMBtu, and the subsequent sale of the futures contract at $4.00/MMBtu, you have a hedging gain of $0.792/MMBtu. As such, your net cost (again excluding all of the fees mentioned above) for December natural gas would be $3.208/MMBtu, the price at which you originally bought the futures contract, thanks to the hedging gain of $0.792/MMBtu ($4.00 - $3.208 = $0.792) on the futures contract. In the second case, let's assume that the prevailing market price, at which you sell your futures contract, is $2.50/MMBtu. As a result, if we again exclude all of the additional line items on the invoice you receive from your LDC; your natural gas cost for December would be $2.50/MMBtu. However, as a result of your hedge at $3.208/MMBtu, and the subsequent sale of the futures contract at $2.50/MMBtu, you would incur a hedging loss $0.708/MMBtu. As such, your net cost (again excluding all of the fees mentioned above) for December natural gas would be $3.208/MMBtu, the price at which you originally bought the futures contract, due to the hedging loss of $0.708/MMBtu ($3.208 - $2.50 = $0.708) on the futures contract. While there clearly are a quite a few details that commercial and industrial natural gas consumers need to consider before hedging their natural gas price risk with futures, the basic methodology is pretty simple. 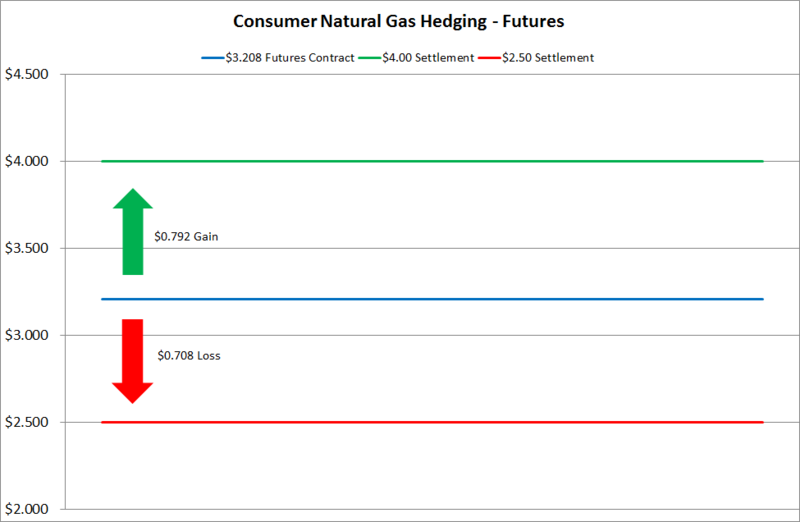 A natural gas end-user (consumer) can hedge their exposure by purchasing natural gas futures contracts. On the other hand, a natural gas producer can hedge their exposure by selling natural gas futures contracts. In subsequent posts we’ll address how natural gas consumers can manage their natural gas price risk with additional instruments such as swaps, basis swaps and options. Editor’s Note: This post was originally published in October 2014 and has been updated to better reflect current market conditions and prices.